The history behind the Indian Hospital is certainly haunting. During those two decades it was primarily used as a tuberculosis sanatorium for indigenous patients from Alberta, B.C., Saskatchewan, the Yukon, and the Northwest Territories. These individuals were largely found through TB screening programs or ‘X-ray Tours’ that set out across the North by truck, ship or airplane. If someone was found to have TB, they would often be evacuated to a sanatorium like the Camsell for treatment. In the 1980s, this boulder was placed in the south east corner of the St. Albert Municipal Cemetery to mark the Aboriginal Cemetery. The whole cemetery sits on the land of the former Edmonton Indian Residential School. The Camsell was the largest Indian Hospital in Canada, and had hundreds of beds. Each person who passed through as well as the many nurses, doctors, orderlies, volunteers and administrators had a unique experience of the institution. 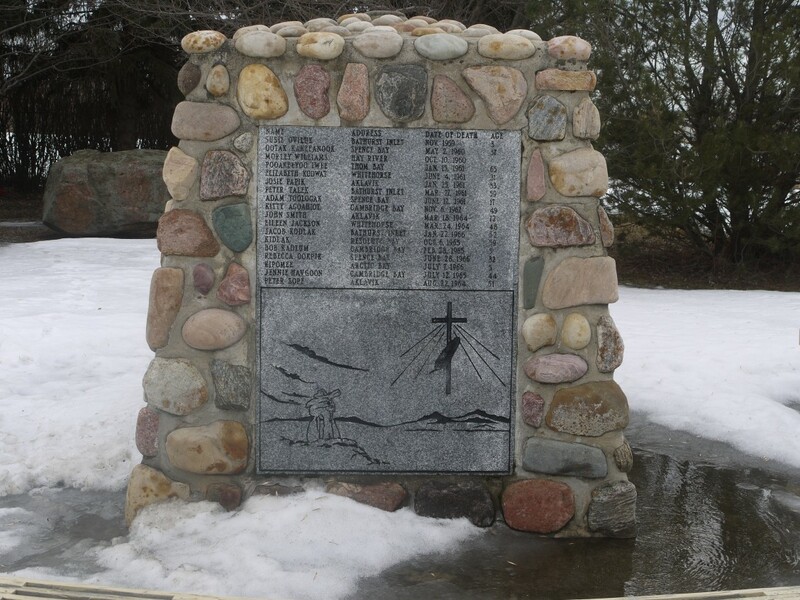 The Ghosts of Camsell serialized blog project explores a small – but so far largely untold – part of this complex history through a cairn erected in 1990 in the St. Albert Aboriginal Cemetery. This cairn and the names inscribed on it are a window into the history of tuberculosis, colonial policies, and the patients who did not make it home.